Viruses are simple yet sophisticated entities. They can penetrate cells and quickly enslave their metabolic infrastructure to produce an army of infectious virions, which will then be able to infect new target cells. Throughout evolution, viruses developed different strategies to ensure optimal infection, while their hosts refined defence mechanisms, as a part of a never-ending arms race. In our new study, we present a new approach to study the metabolic cross-talk between a host and its virus, by combining a classical method in microbiology – the plaque assay – with advanced mass spectrometry imaging (MSI). From the moment a virus enters a cell, the cell is no longer independent. A new entity is formed – a ‘virocell’ (1), that provides the metabolic resources needed for constructing new virions. Giant viruses impose even larger metabolic burden on the virocell, due to their large genome and high burst size. The virocell produces a unique metabolic landscape, which evolves as the infection advances. Yet, tracking the metabolic alterations that occur during this dynamic process in high temporal resolution remains challenging. An attractive model system to study host-virus interactions is the unicellular alga Emiliania huxleyi, which plays a key role in regulating carbon and sulfur cycles in the oceans. E. huxleyi forms massive annual blooms that cover vast oceanic areas and are terminated following infection by the specific E. huxleyi virus (EhV). Left: SEM image of a E. huxleyi cell and two shedded coccoliths (the calcium carbonate structures). Right: TEM image of an infected E. huxleyi cell. Images were taken by Daniella Schatz, Michel Flores and Assaf Vardi. In the lab, we routinely perform plaque assays to assess the number of infectious viral particles. But actually, a plaque assay can provide additional valuable information, due to its unique structure. A plaque originates in a single infected cell and expands via concentric rings. Each ring corresponds to the plaque circumference at a different time point, much like tree rings, keeping a metabolic record of the infection. Essentially, a plaque allows to resolve the infection process in a spatial way, consisting of cells in different stages of infection. Having this spatial structure of the plaque in mind, we asked whether it can reveal information that is otherwise masked in the more common analysis of liquid cultures. In these cases, metabolic values of the entire population are measured together to yield averaged results at different stages of infection, normally by liquid chromatography (LC)-MS. A plaque sample, on the other hand, captures the entire infection process in one snapshot, but cannot be analysed by the traditional LC-MS. For that, we turned to MSI and applied two complementary techniques, which allowed spatial analysis of the plaques. Epifluorescence microscopy image of a plaque sample at 5 days post infection. 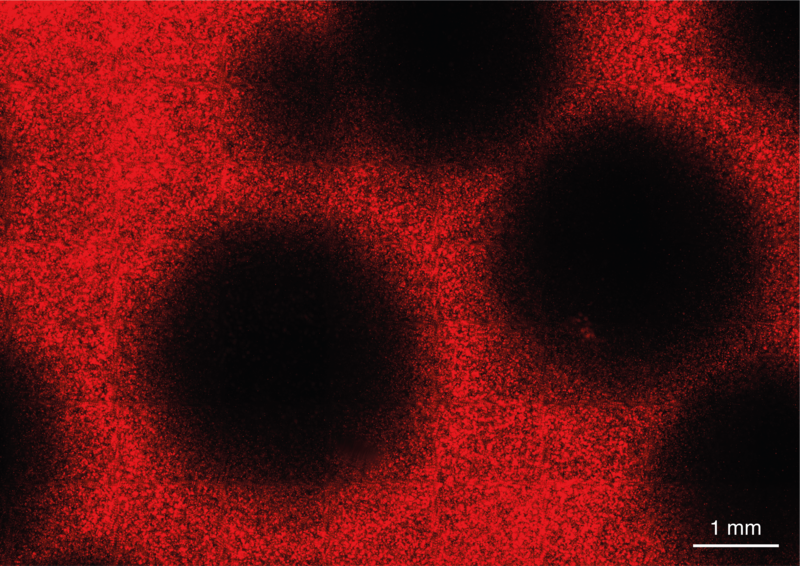 Each red dot represents an E. huxleyi cell, based on the autofluorescence signal of chlorophyll within the cells. Plaques appear as black circles, originating in a population of cells that lysed due to infection and lost their chlorophyll signal. Image taken by Guy Schleyer. We started by looking at the patterns of specific lipid biomarkers across the plaque. These lipids were shown to be reduced or induced during infection in liquid cultures in previous lipidomics studies (2), and we were interested in observing differences between them. Already after the first plaque analysed, we detected astonishing variability in the induction patters of lipids which until then seemed to behave the same throughout the population. For example, some lipids appeared in higher intensity at the centre of the plaque, while others were induced at a greater distance from the plaque centre. 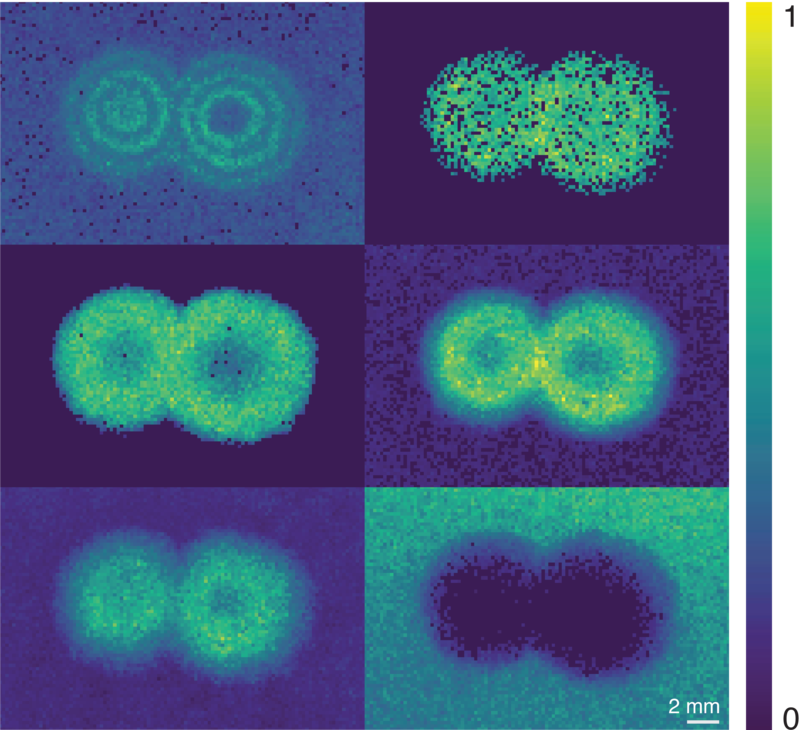 One lipid even had a unique rink-like intensity pattern, thus far unexplained. A plethora of intensity patterns across the plaque suggests the existence of different metabolic states during the infection process. Correlating these states with different phenotypes might allow us to better define the infection states that occur during infection. It can also help us in the future to develop sensitive metabolic biomarkers for detection of different states of viral infection in the ocean. MSI analysis of two adjacent plaques at 5 days post infection using MALDI-MS. MS images of six lipid biomarkers are presented, each one displaying a different intensity pattern across the same plaques. Images taken by Guy Schleyer and Yonghui Dong. We were also interested in discovering novel metabolites that mediate infection or host defence. In order to do that, we performed untargeted analysis of the data, taking advantage of the spatial distribution of the metabolites. We identified different groups of lipids that were induced or reduced across the plaque, and by that we were able to reveal a metabolic shift towards lipids containing an odd-numbered fatty acid chain, C15:0 (pentadecanoic acid). In humans, odd-chain fatty acid lipids are involved in different metabolic disorders. Induction of these lipids during infection might be part of the viral strategy to hijack host metabolism during infection. Cesare Emiliani, one of the founding fathers of paleoceanography (and whom E. huxleyi is named after), once wrote: “Homo sapiens appeared on earth at the same time as the coccolithophorid Emiliania huxleyi… both Homo sapiens and Emiliania huxleyi are dense, worldwide, well-mixed populations… The chances of lethal viral infection would seem excellent for both” (3). By studying the infection process of E. huxleyi in high spatiotemporal resolution, we seek to expand our understanding of infection and defence strategies and the impact of viral infection on the metabolic landscape in the marine environment. We believe that this approach could be applied on diverse host-virus model systems. Host-virus interactions across scales: studying the metabolic landscape of viral infection in high spatiotemporal resolution in the lab can shed light on processes that occur in large-scale blooms. Image sources: Daniella Schatz, Michel Flores, Guy Schleyer and (4). 1. Rosenwasser, S., Ziv, C., Creveld, S. G. van & Vardi, A. Virocell metabolism: Metabolic innovations during host-virus interactions in the ocean. Trends Microbiol. 24, 821–832 (2016). 2. Malitsky, S. et al. Viral infection of the marine alga Emiliania huxleyi triggers lipidome remodeling and induces the production of highly saturated triacylglycerol. New Phytol. 210, 88–96 (2016). 3. Emiliani, C. Planet Earth: Cosmology, Geology, and the Evolution of Life and Environment. (Cambridge University Press, 1992). 4. Sharoni, S. et al. Infection of phytoplankton by aerosolized marine viruses. Proc. Natl. Acad. Sci. 112, 6643–6647 (2015). Assembling the human gut virome, finding the right tools for the job!